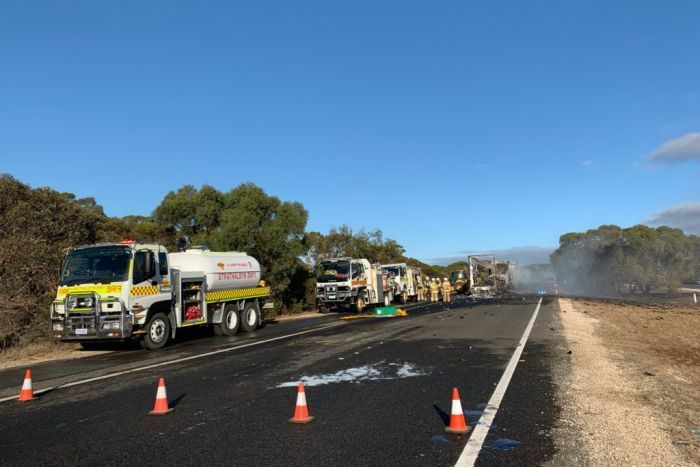 A truck driver was killed and his vehicle destroyed when a rear-end collision sparked a fire on the main road from Adelaide to Melbourne. 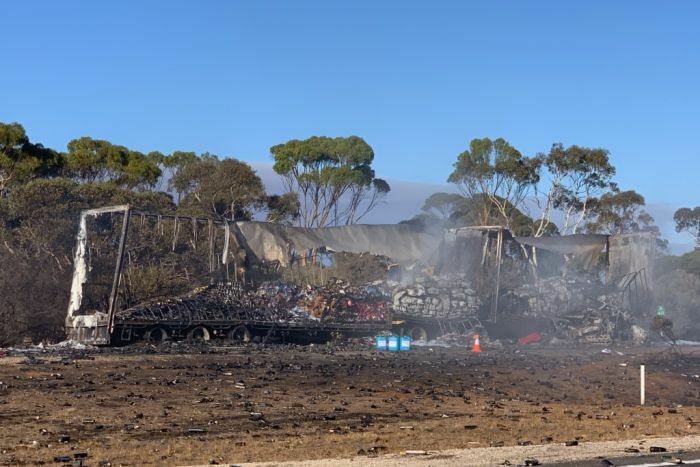 Two trucks collided about 2:30am on the South Eastern Freeway near Monarto in South Australia’s Murraylands. The rear truck, which was carrying aerosol cans, caught fire, which then spread to nearby grass and scrub, requiring several Country Fire Service crews to extinguish the blaze. “The driver of the delivery truck, a 56-year-old man from Parafield Gardens, sadly died at the scene,” police said in a statement. The front truck was transporting cars, but its driver — a 52-year-old Melrose Park man — avoided injury, police said. The road remained closed to traffic in both directions and was not expected to reopen until late today. Diversions were in place between Callington and Monarto and drivers have been advised to expect long delays. The rear truck was gutted by flames and the scene was strewn with debris from the crash. Emergency services remained at the scene, along with SA Police Major Crash investigators. In recent weeks, police have repeatedly pleaded with drivers after a surge in the state’s road toll — which stands at 33 compared with 19 at the same time last year. Yesterday, a cyclist was killed after being hit by a ute at Younghusband, which is also in the Murraylands between Mannum and Swan Reach. A 37-year-old motorcyclist from Goolwa and a 42-year-old man from Mount Crawford were also killed on South Australia’s roads this week.